Clark's preventive action program proactively addresses potential problems before they happen, and root cause analyses and problem solving methods allow us to isolate and correct any mistake very quickly. Then, using proven effectiveness reviews, we close the loop to ensure that all actions taken were successful. Our rigorous internal auditing process ensures procedures are being followed, and our auditors are always looking for ways to help us make improvements. 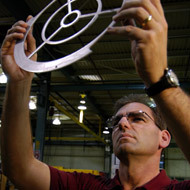 Clark Metal has been certified to various ISO standards since July 2002. While we take great pride in this certification, we understand there is always room for improvement – and everyone at Clark is encouraged and empowered to make improvements every single day.